Venture into the lifts at the Nicholas Building and discover artist Gabrielle New performing new work Every Want is a Breath never to be Breathed again. A BLINDSIDE initiative, [Re]Solve is a dynamic, fluid and elastic approach to exhibition making that focuses on practice that is realised through time. Bringing together video, installation, performance and more, [Re]Solve challenges both traditional artistic and curatorial practice, exploring duration and temporality as the work develops and reaches different stages in the gallery space and throughout the life span of the exhibition. The 2016 debut edition of [Re]Solve brings together artists Oliver Hutchison, Phil Ferguson, Gabrielle New and Nicole Voevodin-Cash. 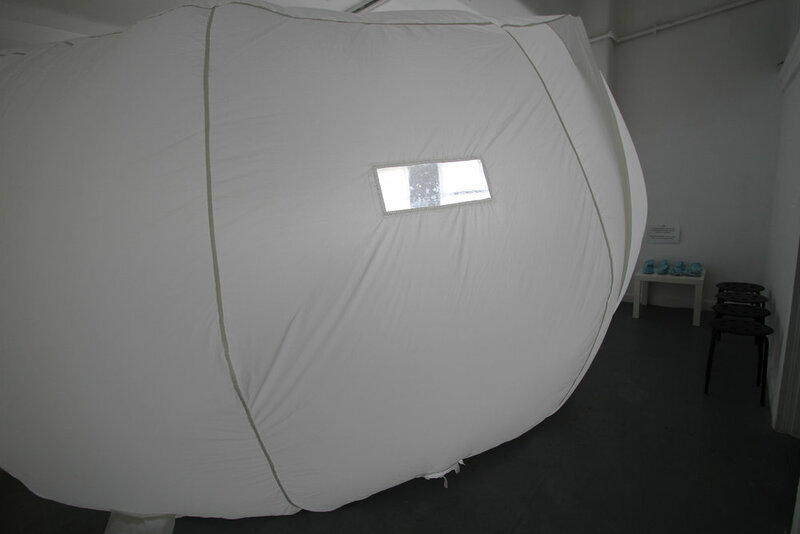 The works in [Re]Solve encompass technology, contemporary culture, nature and human behaviour. Hutchison’s drawing machine Otto is a gentle exploration of attachment and loss between artist, artwork and viewer, while Ferguson utilises his large social media following to extend his practice and question the relationship between the art-making process and Instagram-ready result. New explores the psyche of greed and consumption through intense performance, installation and video, and Voevodin-Cash derives order from chaos creating encompassing installations within the realm of nature and culture. IMAGES | Oliver Hutchison, Reflex (detail), 2015, wall, permanent markers, metal, plastic, technology, 450 x 210 x 20cm |Images courtesy of the artist. Nicole Voevodin-Cash works within the realm of nature and culture, deriving order from chaos, and finding chaos within orderly systems. Her work traverses aspects of the landscape, sometimes being imposed upon it in the tradition of extravagant gardens of the Renaissance, sometimes being derived from it, using the intricate floral patterns, Japonismes and Chinoiseries of the nineteenth centuries as the basis for her sculptural reliefs. In the installation Otto I am creating a playful inversion of the relationship between artist, artwork and viewer, and a gentle exploration of attachment and loss. The robot Otto draws to articulate his fundamental sensitivity to the presence and absence of the audience. Presence is the food that sustains him and which motivates his pace, form and gesture. Absence is poison, slowly draining him of motivation, expression and ultimately life. It is my intention that through this process of drawing - both for and in response to the audience - Otto enacts the symbiotic relationship exists between the artist and the audience/the child and the parent (for neither could be without the other). Of course I am also very interested in questioning - through my outsourcing of work to the robot - the modern embracing of technology. As it could be argued that we are currently become hybridised with our own technology. In this aspect of the work there is a blurry duality at play, for I’m interested in both the role of technology as a stand-in or substitution (affording us an arms length separation from what is real but also a dislocation from the realness) and the converse role of technology as an enabler, a crutch allowing us to extend ourselves in positive ways we never had before. Otto plays out both of these roles for me. 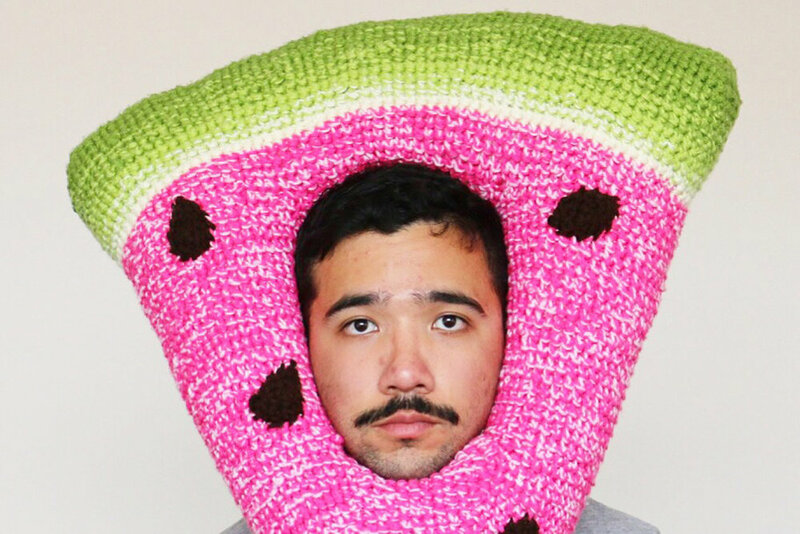 Since August 2014, as a way of connecting and making new friends in Melbourne, Phil Ferguson has been creating crochet hats and posting them on social media platform Instagram with an overwhelmingly positive response. Since then he has now over 100k followers and has been featured by Huffington Post, BuzzFeed, Frankie Magazine, BBC and even on Instagram's account itself. For [Re]Solve, Ferguson will be present within the gallery creating his hats every day of the exhibition. Altering his practice, which is usually purely based on Instagram, Ferguson also plays with the idea of the celebrity artist. The gullibility of greed and vain desires. Gabrielle Leah New is a Multidimensional performing artist who’s practice comprises; Butoh Dance Theatre, Performance, Costume, Improvisation, Video, Photography and Installation. She has a profound interest in healing, ritual and the intra-psychic landscapes of the human mind. Using the body to explore identity, relationship (to self, other and place) and the process of transformation.